Why does Ellicott City keep flooding? And what other local areas are at risk? 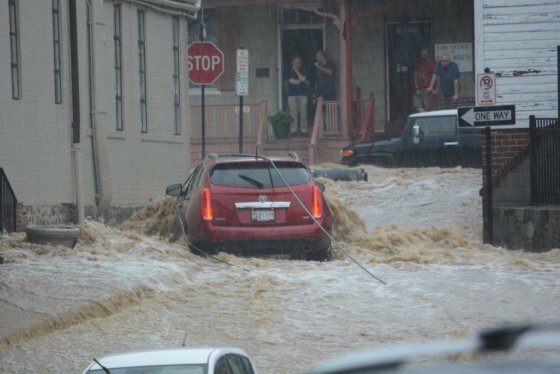 The flooding on May 27 overwhelmed Ellicott City's stormwater drainage network and inundated the quaint historic district on the Patapsco River. As development continues, experts say planners must continue considering the effects on stormwater runoff in future projects across the DMV. Being at bottom of a slope and at the confluence of streams was ideal for the mills that once operated there. Today, it can mean disaster when a deluge of rain and runoff causes channels to jump their banks and turn Main Street into a raging river. The latest round of flooding on May 27 dropped 5 inches of rain on the town in two hours. It overwhelmed the drainage network and inundated the quaint historic district. “If you put that 5 inches over any place you’re going to have some sort of problem,” said Jason Elliott, a hydrologist with the National Weather Service in Sterling, Virginia. 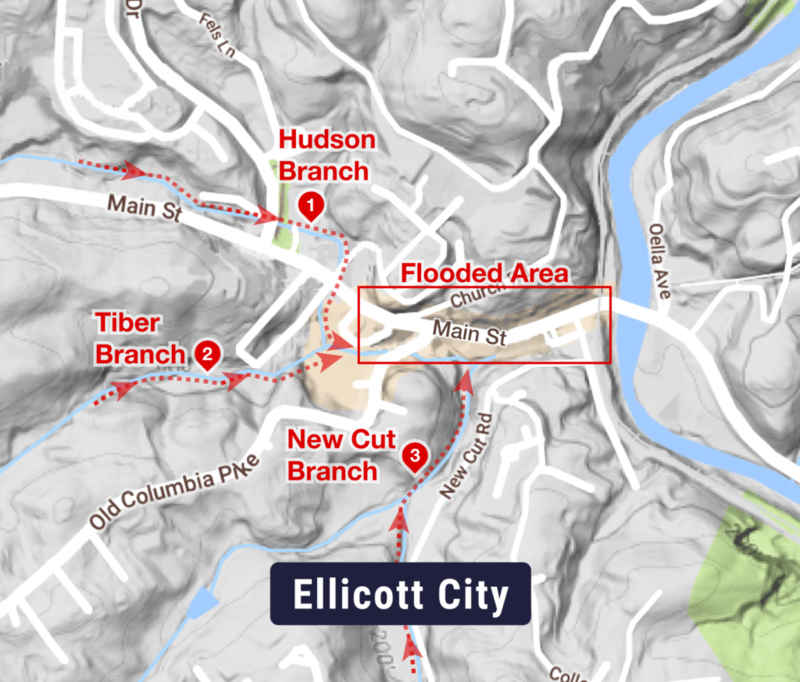 The roughly 4-square-mile Ellicott City drainage area funnels down into several streams including the Hudson, Tiber and New Cut branches. They meet near Main Street, before draining into the Patapsco River. This year’s flood, and the one in 2016, were different from past events because the water rushed downhill instead of slowly rising from below. The overwhelmed streams couldn’t drain fast enough and backed up into Main Street. The Hudson Branch, Tiber Branch and New Cut Branch all converge near Main Street in Ellicott City. Two massive floods in 2016 and 2018 decimated the area. The geographical characteristics making Ellicott City susceptible to flooding are fairly unusual in Maryland, Edward McDonough, a spokesman for the Maryland Emergency Management Agency, said in an email to WTOP. But it is not the only place that floods during serious rain events. The NWS keeps a list of populated areas with structures near streams that are known to flood in D.C., Maryland and Virginia, Elliott said. Those areas include Northeast D.C. near the Minnesota Avenue Metro Station, parts of Laurel, Maryland, and Alexandria’s Cameron Run, which passes between the Capital Beltway Outer Loop and Huntington Park. Baltimore’s northeast quadrant and the Dead Run watershed area of Woodlawn are also prone to flooding, said Jon Dillow, a supervisory hydrologist for the U.S. Geological Survey’s Maryland-Delaware-DC Water Science Center. That’s because nearly 40 percent of the area is covered with pavement or buildings. “They don’t get quite as much press because, fortunately, we don’t have quite as much infrastructure down where the river wants to run through,” Dillow said. 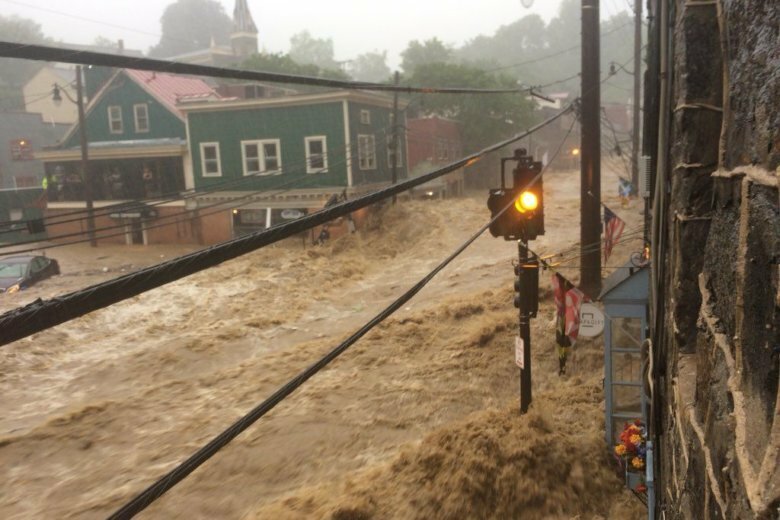 Massive flooding ripped through Ellicott City, Maryland, Sunday evening following heavy rains and storms. See photos and video. Developers should make sure to consider stormwater runoff when building new projects, said Joe Sexton, the chief scientist at terraPulse and an associate research professor at the University of Maryland’s Department of Geographical Sciences. In severe rain events, stormwater flows faster off impervious surfaces than it would off undeveloped land, he said. Sexton used computer algorithms to analyze satellite images of roughly 7,700 square miles covering the D.C. and Baltimore metro areas. He examined how much of the area has been paved or built on from 1984-2010. The pace of development about doubled during the period they studied, he said. A Baltimore-sized area is a fraction of the total area Sexton’s team studied but, he said, some development is concentrated in places, such as near Dulles International Airport and Howard County. That could mean more runoff finds its way into places such as the streams behind Main Street. Howard County officials acknowledge that development played a role in the Ellicott City flood, but it’s unclear how much. “In this particular case, the high concentration of heavy rain in a short time was the chief factor,” said Paul Milton, an assistant to Howard County Executive Allan Kittleman. A Howard County-commissioned report found that the area would still be susceptible to flooding in severe storms during these types of rain events, even if the area draining to Ellicott City was undeveloped. Stormwater rules for builders have only been on the books since the 1980s, Milton said. About 60 percent of the development in the Ellicott City watershed took place before 1991. To protect the city, report authors recommend fortifying buildings and upgrading stormwater mitigation structures. The county has made efforts in the Main Street area against future floods. It has been working on projects to restore streams, improve culverts, strengthen structures and hold back erosion. The county announced less than a month ago it received $1 million to improve a culvert near Main Street and improve downtown’s storm drainage network. But the potential for flooding is always present, Sexton said. Especially because experts believe global climate change will increase the intensity of storms.